Canon has a fairly simple system for naming its various digital single-lens reflex (SLR) cameras. There are cameras that are named with a single-digit number, like the 1DS and 5D (the EOS 5D Mark II [ ], to be precise); these represent the upper end of the product line. Then there are the cameras named with a two-digit number, such as the 50D; these cameras fill the mid-range of Canon’s SLR line. Finally, there are the various Rebels, which hold up the lower end of Canon’s offerings. But to call the EOS Rebel T1i a low-end camera is fairly crazy. Offering 15-megapixel resolution, excellent low-light performance, and high-definition video recording, this is a camera that’s good enough for many professional shooting situations. Packed into a small, lightweight body, and shipping in a kit with a 18mm to 55mm lens, the T1i costs around $900. Canon also sells a body-only configuration for $800. For the most part, the T1i’s body isn’t that different from that of its predecessor, the EOS Rebel XSi ( ). The T1i is a very compact camera that doesn’t sacrifice comfort or stable shooting to achieve its small footprint. The overall control layout is largely unchanged from previous Rebels, so if you’re already familiar with the T1i’s ancestors, you’ll feel right at home with the new camera. As with all Canon SLRs, almost all of the essential shooting controls are accessible through external camera controls. White balance, autofocus, drive mode, exposure compensation, exposure lock, and program shift modes all have dedicated buttons, and the T1i’s control layout allows you to easily alter any of these parameters (as well as shutter speed, aperture, and ISO) with one hand. Since essential exposure controls are right near the shutter button, you can easily change shutter speed, aperture, and ISO without ever removing your eye from the viewfinder. In addition to size, the main feel and interface difference between the T1i and Canon’s mid-range cameras (like the 50D) is the control layout on the back of the camera. Where the 50D provides a rear-mounted wheel that you use for navigating menus and changing parameter settings, the T1i offers four buttons arranged in a circle. While the wheel is a little faster, and is easier to use without looking, the Rebel’s four-way button pad works fine, and you should find navigation and control quick and easy. The 3-inch LCD on the T1i is Canon’s latest, and it’s beautiful. It has more resolution (920,000 dots) and better detail than the screen on any previous Rebel, and provides easier-to-read menus and a clear, sharp view of your images, even in bright sunlight. As with any LCD screen, it’s still not accurate for judging color and exposure, though the on-screen histogram gives you a way to work around those limitations. And while the screen does show very fine detail, it’s still not good enough for assessing subtle focus problems. As with previous Rebels, the T1i’s LCD screen automatically deactivates when you raise the camera to your eye, so you don’t have it shining in your face while shooting. The LCD screen displays all of the camera’s current status information, and you can even change settings using this screen. The ability to see and alter settings on the back of the camera is great when you’re working on a tripod. The T1i offers Live View, but Canon has streamlined the Live View interface. There’s now a dedicated Live View button on the back of the camera, and you no longer have to go into a menu to activate the Live View feature. The EOS Rebel T1i has a3-inch LCD. If you’ve never used Live View on an SLR, be aware that autofocusing is different than what you may be used to on a point-and-shoot camera. When you activate Live View, the camera has to raise the mirror (the one that normally bounces light from the lens up into the viewfinder) to expose the sensor, to generate a live image to show on the LCD screen. Unfortunately, the autofocus sensors are in the top of the camera, so when the mirror goes up, the autofocus sensors go blind. This means that, unlike with a point-and-shoot camera, the T1i cannot continuously autofocus when in Live View mode. By default when in Live View mode, the T1i autofocuses by using its internal computer to analyze the image, rather than using the usual autofocus sensors. This yields much slower autofocus times, so don’t expect to be able to quickly focus and re-focus on different locations. If you want faster autofocus, you can switch to a different Live View autofocus mode that temporarily flips the mirror back down when you want to focus. This allows the camera to autofocus normally, but results in a blackout of the image on the screen. Finally, you can also simply use manual focus, and the T1i provides an excellent Live View zoom feature that makes it easier to determine focus. The T1i provides a full feature set. It doesn’t offer extravagance in its features—for example, auto-bracketing is limited to three stops, and burst mode runs around three frames per second—but it does provide everything you need for most of the situations that most photographers will ever find themselves in. When it does come time to dig into a menu to change a setting, you’ll find that the menus are arranged such that you never have to scroll down a menu, so you can always see all of the contents of any menu. This makes finding menu items very easy, and navigating the camera’s menu system is very speedy. The camera’s customization features are a little limited, but this is not unusual in a camera at this price. The T1i offers a single, customizable menu that you can configure any way you want. With My Menu, you can choose the half dozen menu items that you use the most, and consolidate them in one place, making them quick and easy to access. Canon’s Rebel line has been very strong for a while now, so the most astonishing thing about the T1i is that Canon has managed to dramatically improve the image quality. Overall image quality is great, and the camera does a startlingly good job of shooting in low light at high ISOs. While the previous Rebels began to suffer above ISO 800, the T1i delivers fantastic results at ISO 1600, and even produces usable images at ISO 3200. This supposedly lower-end camera delivers high ISO results that are better than you’d have seen with the pro cameras of just a couple of years ago. Like most consumer-oriented cameras, the T1i offers a selection of scene modes, selectable from the top-mounted mode dial. These modes set the camera’s auto settings toward particular shooting situations, such as sports, landscape, portrait, and so on. The Movie scene mode activates the Live View screen, and allows you to start shooting video. The T1i offers three movie resolutions—640 by 480 and 1,280 by 720, both at 30 frames per second, and a full HD resolution of 1,920 by 1,280 at 20 fps . Image quality is generally fantastic, though of course it varies depending on your lens quality. Unlike the higher-end 5D Mark II, the T1i does not provide an external microphone jack, so if you’re serious about audio, you’ll need to record it separately and sync it later. For casual shooting, the internal mic is good, though it does pick up any camera handling noise. There are no manual exposure controls available when shooting video. 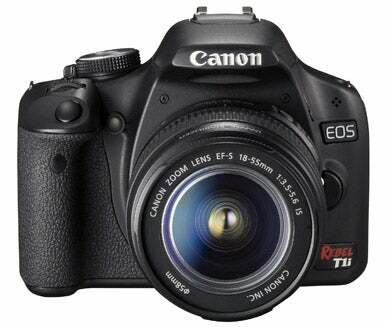 The EOS Rebel T1i is Canon’s best Rebel yet. If you need a faster burst rate, or don’t like the Rebel’s button-centered interface, or the camera is too small for your hands, then you’ll also want to look at the EOS 50D, the next camera up in Canon’s line. (Note that you won’t get video shooting with that camera.) If you’re looking for an SLR under $1,000 that takes great images and movies, then the Rebel T1i is an excellent choice.